The Cushionista 2.5 Carat Cushion Cut Cubic Zirconia Princess Cut and Round Solitaire Engagement Ring features a 2.5 carat 8mm cushion cut center cubic zirconia set in a cupped, split double prong setting. 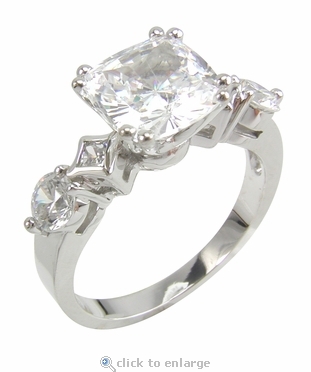 The side stones include a bezel set princess cut followed by a round brilliant diamond quality cubic zirconia. This ring makes for a unique engagement ring with the combination of the different shapes of stones. All the stones in this ring feature our Russian formula cubic zirconia that are hand cut and hand polished to exact diamond specifications. Coupled with a lifetime warranty on our cubic zirconia and a one year warranty on our mountings, you can be confident in your Ziamond purchase. 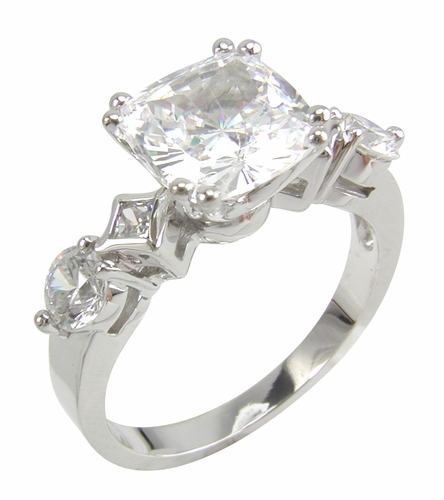 The total carat weight is approximately 3.25 carats. This ring is pictured here in 14k white gold but you can have this ring custom made in 14k yellow gold or platinum. Due to extremely low pricing, all clearance sales are final. Clearance items are stocked in a certain finger size(s), see below. They may be sized for an additional fee, see the Sizing options window below. Sizes below a 5 or above an 8 can be made via Special Order, Call 1-866-ZIAMOND for a quote.